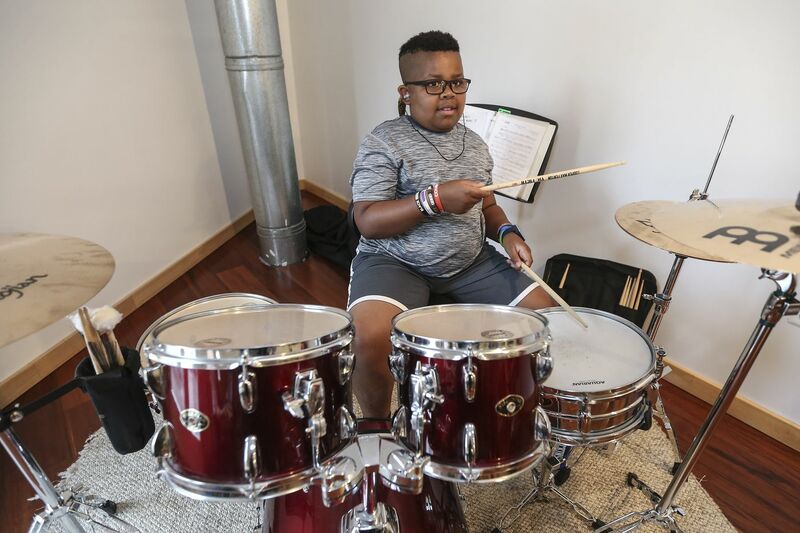 8-year-old Cooper Fenton on the drums during a rehearsal of Shakespeare in Clark Park's "Twelfth Night." Shakespeare in Clark Park is going back to its roots with a reprise of its first free outdoor production, Twelfth Night. The staging for this one will have a different twist from that first one, in 2006: It's a glam-rock adaptation featuring a live community band. The show, directed by Jack Tamburri, who splits his time between New York and Philadelphia, will open Wednesday, July 25, and play nightly at 7 p.m. through Sunday in the West Philadelphia park. "Shakespeare was absolutely writing with the assumption of live musical scoring," Tamburri says. SCP's productions always include what the organizers call "radical community engagement." They cast 100 neighbors for an epic battle scene for 2014's Henry IV: Your Prince and Mine and taught people to lindy-hop for 2016's The Two Gentlemen of Verona. This year, eight talented young musicians who live in and around Philly — six of whom are in middle school — will play in a community glam-rock band, performing songs written for this production by Philly theater scenester Jess Conda and composer Elizabeth Atkinson. Jackie Soro, music director of Shakespeare in Clark Park’s “Twelfth Night,” leads the band during rehearsal. Kitt O'Neill, the company's artistic director, said forming the young people's rock band was one of the challenges of this year's production. They had never played together and came from varied backgrounds. Some had performed in school bands, while others had professional experience. In the middle of a bustling rehearsal last week, Conda practiced how she would introduce members of the band onstage, calling out stage names such as "Rocky Hockey," "Spacey J," and "Djembe Jam," which made the younger members of the band giggle. The talented drummer Cooper Fenton of Swarthmore banged out rim shots and stings that made the Elizabethan script sound like a sitcom. He is just 8 years old. Rehearsal for Shakespeare in Clark Park’s “Twelfth Night,” with Jess Conda as Feste (center) and Cooper Fenton on drums. Tamburri chose a glam-rock aesthetic to make the show as broadly appealing as Shakespeare's original productions were for Elizabethan theatergoers. The Bard shares common ground with such '70s glam-rockers as David Bowie in their "melancholy talk about love and loss and the difficulties of the heart," he said. Shakespeare also dressed his players in what was, in his era, contemporary dress, Tamburri said. Shakespeare in Clark Park's costume designer, Natalia de la Torre, hand-made the production's '70s-style garb. Conda said Ziggy Stardust is the main influence, so patrons can expect lots of glitter. Singing during a rehearsal of Shakespeare in Clark Park’s “Twelfth Night” is Pax Ressler (center), who plays Viola. Twelfth Night is a play about a love triangle involving cross-dressing and mistaken identity, and Tamburri has cast some gender-fluid actors to punch up the way Shakespeare pokes fun at rigid gender identities. "It's a play about a very rigid, courtly world in which a gender binary is of high importance," he said. "The characters are really invested in the idea of men are men and women are women." At the rehearsal, the most striking quality of the cast was its diversity of ages and experience levels. Their run-throughs had an atmosphere of learning and encouragement. Older cast members rocked out while the young band practiced its numbers, and the younger cast members watched in admiration as the professional actors delivered their lines. "The community engagement aspect, it makes perfect sense to me," said Tamburri. "Large-scale outdoor theater should be in constant communication with the community surrounding its production." Shakespeare in Clark Park "Twelfth Night"
Performed at 7 p.m. nightly Wednesday, July 25, through Sunday, July 29, at “The Bowl” in Clark Park (43rd Street and Baltimore Avenue), free. Rain location: Prince Theatre, the Annenberg Center for the Performing Arts, 3680 Walnut St. Rain-relocations announced on the Shakespeare in Clark Park Facebook page, at 215-764-5345, and at shakespeareinclarkpark.org/twelfthnight.